I hear the concerns all the time. 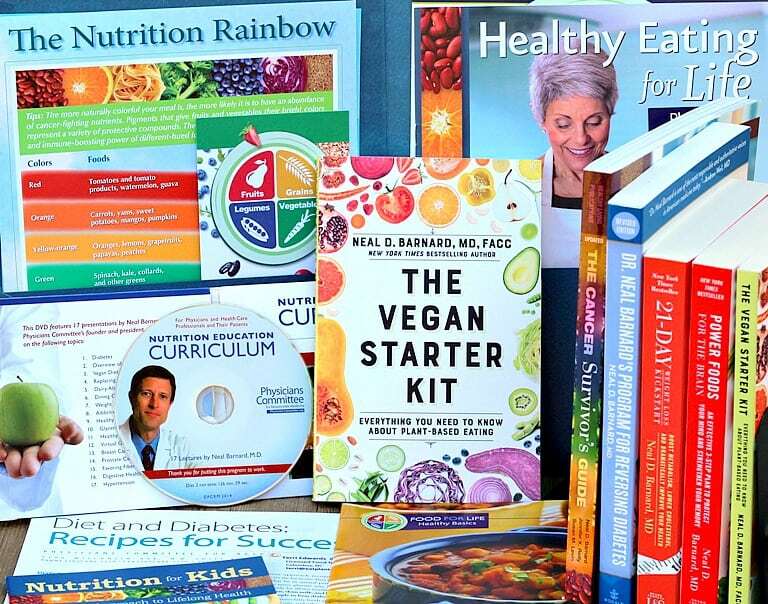 People who want to regain their health and find freedom from chronic disease by switching over to a whole food plant-based diet are often concerned that they will never be able to bake and enjoy treats again. Let us help dispell that myth with this Dairy-Free Baking Guide with Recipes. Thankfully, that just doesn’t have to be the case, as this healthy baking guide will demonstrate with some great plant-based tips that include substitutes for vegetable oil and dairy free baking. While I don’t recommend feasting on sweets everyday, there is definitely a place for them in a healthy plant-based lifestyle. I can’t wait to share some of my favorite vegan baking recipes with you! Whether it’s for a birthday party or a family gathering, baking is an opportunity to show friends and family just how delicious healthy plant-based food can be. Desserts like Glaze Carrot Cake and Hot Fudge Cake can indeed still be enjoyed. 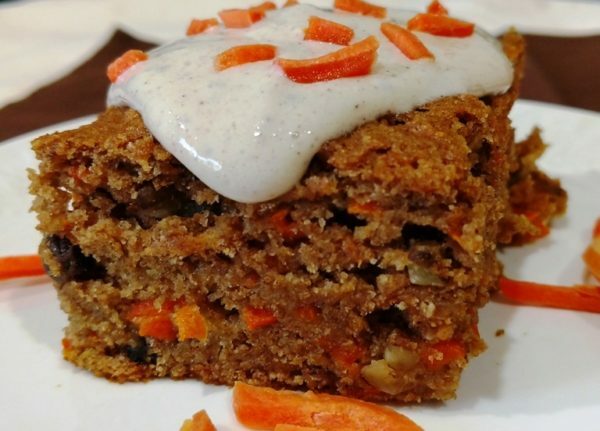 Glazed Vegan Carrot Cake. Click photo to view full recipe. The trick is to learn how to bake your favorite recipes in a whole new and tasty way. It’s the butter, oil, milk, eggs and white flour in everyday baking recipes that we need to get rid of, so what can they be replaced with? These are some great baking substitution tips to help adapt your old recipes to a new healthier whole food plant-based version. Many times, people new to a plant-based lifestyle try to replace butter and oil with some of the processed vegan butters on the market. 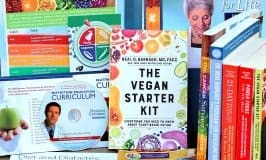 The problem is that, while technically vegan, these products are NOT a healthy option. They are 100% fat and much of it is artery-clogging saturated fat. But don’t despair, because there are healthy baking substitutions that you might already have on-hand. Applesauce can be used as an oil substitute in most cake and muffin recipes. The rule of thumb is to substitute 1/3 of a cup of applesauce for every 1/2 cup of oil or margarine. For those readers in countries that don’t have pre-made applesauce, Genius Kitchen has a recipe to guide you through making your own. Nut butters like almond, cashew, or peanut can also be used, especially with cookies. Just remember look for varieties that don’t have added sugar or oil. They should have only one ingredient–nuts. The rule of thumb here is to use an equal amount of nut butter to replace the margarine or oil in a recipe. If it needs to be thinned out a bit, add a little plant milk and whisk to desired consistency. Aqua-faba is a fairly new option which is the liquid from canned or freshly cooked chickpeas. While the flavor is neutral, the consistency is similar to oil, though lighter. Use an equal amount of aqua-faba to replace the oil in a recipe. Hot Fudge Cake. Click photo to view full recipe. White flour is vegan, but it is highly processed and not healthy, since it’s been stripped of its nutritional value. The better option is to go with whole grain flours like wheat, spelt, oat, and others. The Whole Grains Council defines whole grains to be foods that contain all the essential nutritional parts of the whole grain kernel. That means the food must include the bran, germ and endosperm in the process of grinding, crushing, cracking or extruding the kernels. For those with gluten sensitivities, try using buckwheat, brown rice, millet or chickpea flours instead. This gluten-free baking guide may help. You can even make your own self-rising flour from whole wheat, unprocessed flours. Just mix one cup of flour with 1-1/4 teaspoons of baking powder and 1/4 teaspoon of salt. Without the salt and baking powder, baked goods will not rise. White whole wheat and whole wheat pastry flours aren’t bleached or stripped. 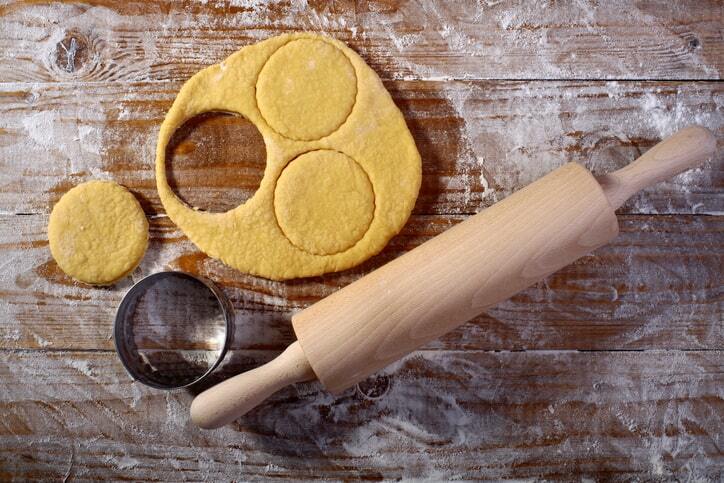 They are best used for cookies, cakes, muffins and delicate pastries. Oatmeal Walnut Raisin Cookies. Click photo to view full recipe. Replacing milk is the easiest of all. Simply substitute regular dairy milk with equal amounts of almond, soy, rice, or other plant milks to make dairy-free desserts. Soy and cashew milks tend to have a rich creamier texture. Coconut milk is vegan but the saturated fat content is very high, so it’s best avoided. To replace buttermilk, mix one-cup of plant milk with 2 tablespoons of lemon juice, apple cider vinegar or brown rice vinegar and let stand for 5-10 minutes. Replacing eggs can be a little trickier, and it really depends on the function of the egg in the recipe. Here are some options for replacing one egg in a recipe to make some great eggless desserts. Combine 1 tbsp of flax seed with 3 tbsp. of water and blend in a food processor or blender until gelatinous. For binding, use 2 tablespoons of cornstarch mixed with 2 tablespoons of water and mix well. Use 2-3 tbsp. of mashed banana in baked goods like muffins. Substitute 3 tbsp. of aqua-faba for each egg in a recipe. Powdered egg replacers can also be purchased at many health food stores. 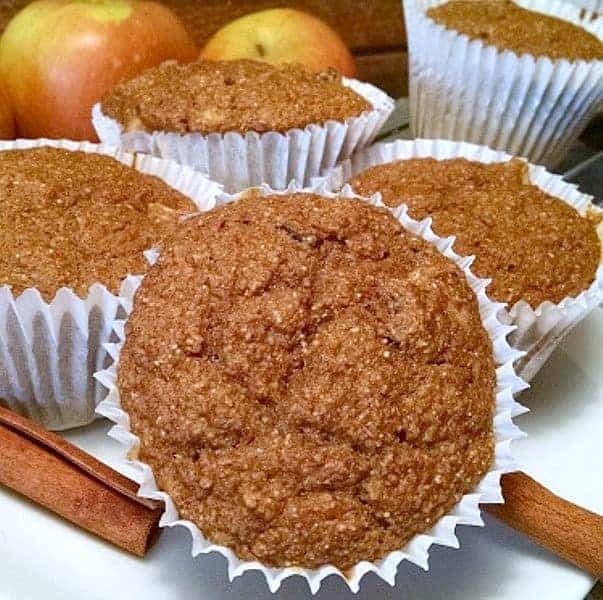 Apple Cinnamon Muffins. Click photo to view full recipe. 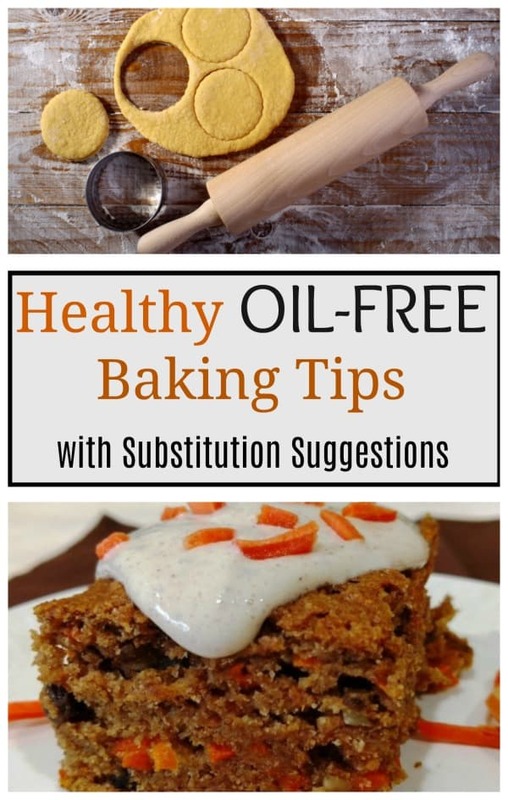 To keep baking completely oil-free, you will want to use parchment paper, non-stick pans, or silicone baking pans. Yes, I know that can of cooking spray in your cabinet says fat-free, but let’s think about it for just a minute. What is in that can of spray? It’s oil! And how much fat is in all oils? It’s 100% fat! So how do the manufactures get away with saying it is fat-free? They make serving sizes completely unrealistic. 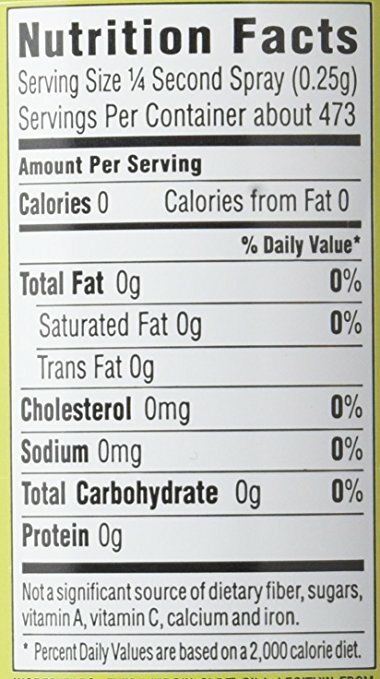 Nutrition label on cooking spray says a serving is 1/4th of a second. Turn the can around and look at what they call a serving size. Most cans of cooking spray say a serving size is 1/3 to 1/4 of a second. I am serious, just go look at your can. Current regulations say that if there are only traces of fat in a serving size, manufactures can round that down to zero. One-fourth of a second of cooking spray is not a realistic serving size, and saying it is is downright deceiving. So, to avoid using that 100% fat cooking spray, there are a couple of different substitutes for vegetable oil. Try lining baking pans with parchment paper. I do this all the time with great success. 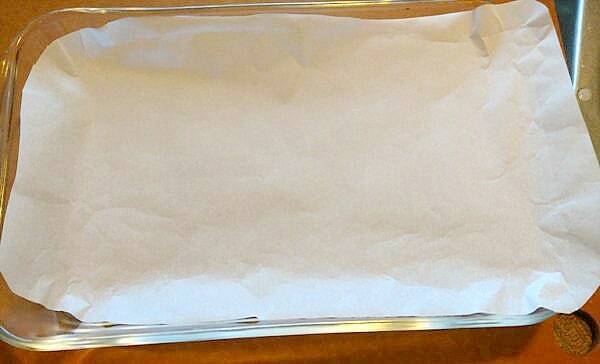 Baking pan lined with parchment paper keeps cakes from sticking without oil. 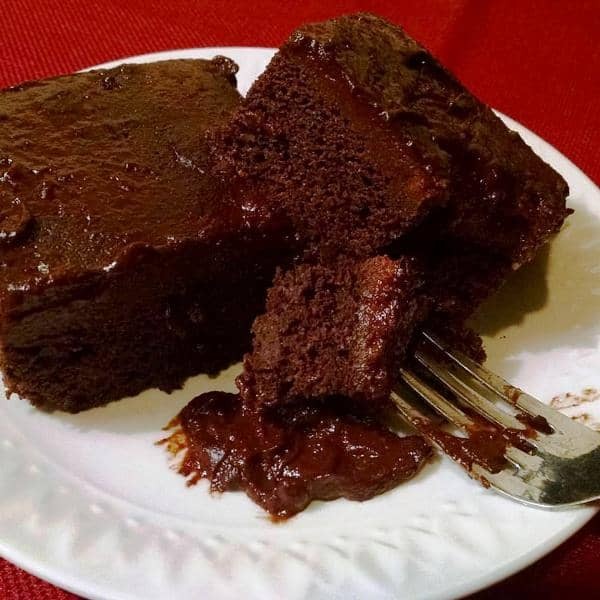 Another option would be to use non-stick pans or silicone baking sheets that enable cakes, muffins, and casseroles to slide right out of the pan without sticking. Non Stick Silicone Baking Mold Tray 3-in-1 Set for Cupcakes, Muffins and Brownies. Click to view it using my amazon affiliate link. 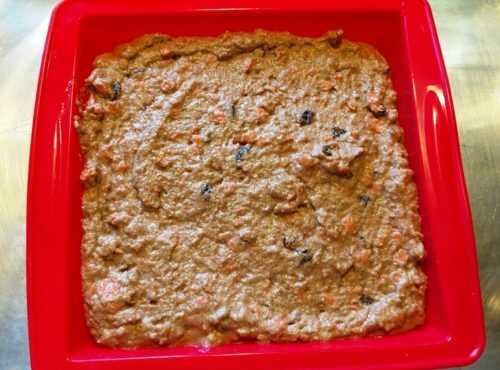 This is my Glazed Carrot Cake in a silicone baking pan. Baking in a silicone baking dish is easy. Don’t be afraid to experiment. Some recipes will take some tweaking to find out what works best. It takes time to figure out the right balance for each recipe, because no two are exactly alike. In time, you will discover that healthy dairy free baking can be a lot of fun with these baking tips! Be adventurous and don’t give up. You will have wonderfully sweet healthy baked goods with a little practice. Healthy oil-free baking can be so much fun! 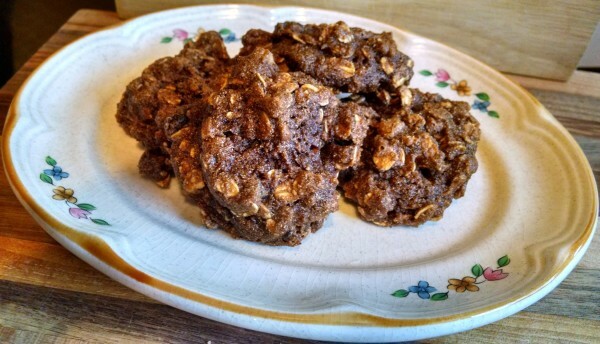 Brandi with The Vegan 8 has some great oil-free cookie recipes, all with only eight ingredients or less. Dana with Minimalist Baker has a recipe for Whole Wheat oil-free bread as well. This Gluten-Free Baking Guide from No Meat Athlete might be helpful for those who are searching for gluten-free options. plant based, but now I am excited to try some. For the buttermilk, how much lemon juice or vinegar should I add to a cup of plant milk? Also, I’m curious, what is that in the first photo with the rolling pin? 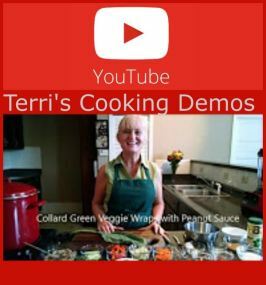 I love all your recipes, hints and videos – so helpful! 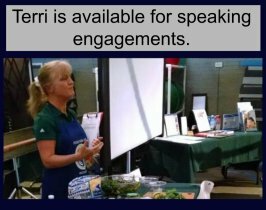 Vickie, I am so glad to hear that you will soon be back in the kitchen baking up some goodies! The photo is just a stock photo, so I’m not sure what they were making, but Brandi with The Vegan 8 has some great cookie recipes that are linked in the article. Be sure to check those out. I’m surprised there was no mention of replacing processed sugars with things such as pureed dates, date sugar, or other mashed/pureed fruits. While I know very little about baking pastries and sweets, I’m sure things like cane sugar and corn, rice, and agave syrups can usually be minimized, if not avoided entirely with whole food sweeteners.